NONSTOP FERTILIzATION AS NATURE INTENDED! A regular supply of nutrients are required for aquatic plants to grow healthy and strong. Usually planted tanks are fertilized on a weekly schedule, which means that larger quantities of nutrients are supplemented at regular intervals. A Dosator fertilizes your aquatic plants as in nature, in that they are provided a small quantity of nutrients on a continuing basis. 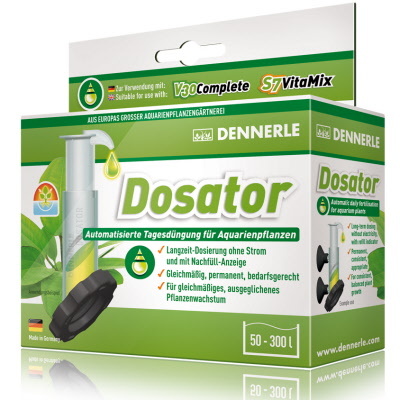 The Dosator is especially designed for the Dennerle fertilizers V30 Complete and S7 VitaMix. V30 is dispensed automatically over 4 weeks; S7 over the space of 1 week.